10/12/10 – Art market – London – Nicolas Poussin’s painting, Ordination (ill. 1), part of the Seven Sacraments series (of which only five were still together in the Duke of Rutland’s collection), did not sell at the auction held on Tuesday, 7 December at Christie’s London (see news item of 6/12/10). This may seem strange given the fact that this is an important work by the French master. Although the estimate seemed a bit high (15 to 20 pounds), we should recall that the Flight into Egypt purchased by the Musée de Lyon (see news item of 18/7/07) had been acquired for 17 million euros, which today corresponds to almost 15 million pounds, that is, the lower end of the estimate which might justify claims by some that Lyon had paid too much. However, we should keep in mind the current economic crisis which has significantly affected the financial status of many museums. 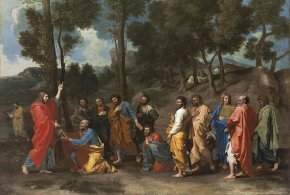 Also, Poussin is a difficult artist who does not necessarily attract private collectors. As for those museums with a potential interest in acquiring it, such as the National Gallery in London where it was on deposit for many years, or the one in Washington which already owns another canvas belonging to the same series, they cannot really afford this high price tag today. Even the wealthiest establishments like the Getty have lost significant amounts and find themselves with restricted acquisition budgets. No hasty conclusions should be drawn therefore from this unexpected event in the art market. In fact, Christie’s will no doubt now attempt to sell the painting by mutual agreement. 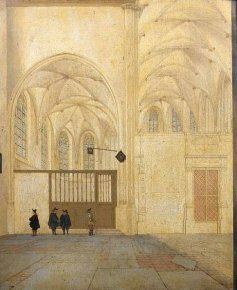 We would also like to point out that Bonhams’ presented a painting ascribed to Pieter Saenredam’s workshop (ill. 2), estimated at only 20.000 to 30.000 pounds which sold finally for 1.4 million pounds as many observers considered that this was in fact an entirely original work by the master.